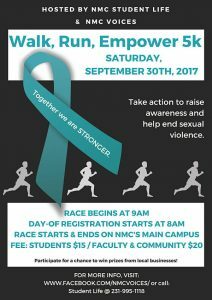 TRAVERSE CITY — On Saturday, September 30, NMC Student Life, in partnership with the NMC student group Voices, will host Walk, Run, Empower, a 5K Run/Walk to both raise awareness and help end sexual violence. Sexual violence is a prevalent issue both on and off college campuses, and it is extremely important to raise community awareness in order to generate change. Walk, Run, Empower was created with that intention, while also bringing together Northwestern Michigan College and the community in a fun, exciting and active way. All proceeds will benefit NMC Voices to further their advocacy and support for student survivors of sexual violence. The 5K will start at and end on College Drive; the race begins at 9 a.m. Cash and checks can be made payable to NMC (subject memo: Voices) and will be accepted on the day of the race. Participants can enjoy free snacks and refreshments, while connecting with many of our student organizations, campus resources and community collaborators before and after the race. Registration fee is $15 for students and $20 for faculty, staff, and community members. Entry fee also includes a Walk, Run, Empower 5K race t-shirt! Please join us as a runner, walker, volunteer or supporter for this 5K benefit race. You can sign up to participate in the race, to be a volunteer, or to have a table, using the links below. We will also have same day registration, which will begin at 8 a.m. the morning of the race. Join us as we walk, run and empower one another towards a world free of violence.